NYPD: Some arrests were pre-arranged Jump to media player Thousands of demonstrators have marched on New York's Brooklyn Bridge after a day of protests to mark two months since the beginning of the Occupy Wall street movement against economic inequality. Judge upholds New York eviction Jump to media player A New York court has ruled that a pre-dawn police raid on the Occupy Wall Street camp at Zuccotti Park was legal. New York police clearing protest Jump to media player Hundreds of police officers have cleared the Occupy Wall Street camp in New York's Zuccotti Park. 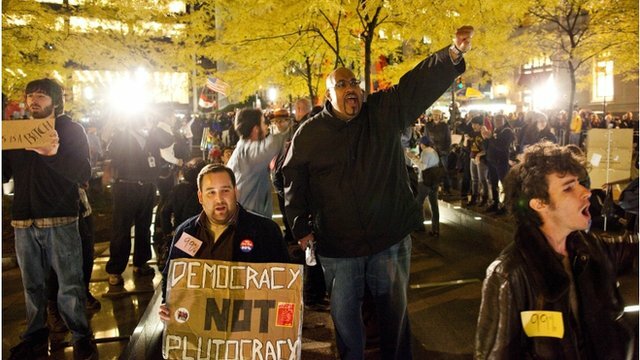 NYPD defends clearing of Occupy protest Jump to media player Deputy Commissioner of Public Information for the New York Police Department, Paul Browne, said the police acted ''even handedly'' in the face of resistance. Thousands of demonstrators have marched on New York's Brooklyn Bridge after a day of protests to mark two months since the beginning of the Occupy Wall street movement against economic inequality. At least 200 protesters were arrested, many of them as they tried to block traders from reaching the city's stock exchange. Lines of police and barricades were ranged against the demonstrators, who were evicted from their encampment at Zuccotti Park on Tuesday. Deputy Commissioner of Public Information for the New York Police Department, Paul Browne, said the officers were instructed to allow lawful protest, but arrest people who broke the law.